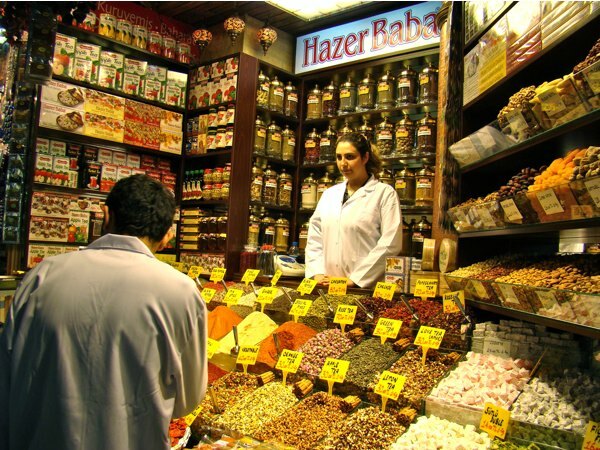 At the Spice Bazaar or Egyptian Bazaar we discovered the wonders of teas and spices at Hazer Baba. Here you may find flavours to bring home and infuse your own teas with countless familiar and surprising aromas, and think back on your Eastern adventure. 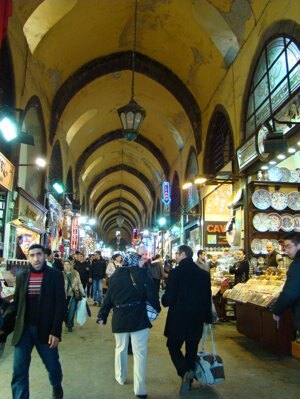 The Spice Bazaar, (Turkish: 'Mısır Çarşısı', or Egyptian Bazaar) in Istanbul, is one of the oldest bazaars in the city. It is the second largest covered shopping complex after the Grand Bazaar. The building was completed in 1660 and is connected to the Yeni Mosque, located by the mouth of the Golden Horn. Most of the spices found here was originally imported from Egypt, hence the name. We used hours walking around in the beautiful ornate arcade just to see what was offered. This is definitely the place to go to buy spices. I ended up with a bag of the omni present dried mint, star anise, and a strong pepper mix perfect for stews and soups. Another thing to explore is the Turkish passion for tea. In my Turkish grocers I've already discovered the large numbers of varieties, and I tried a few. The apple flavoured tea is a perfect hot drink during winter time. But at the Spice Bazaar you may choose from so many other intriguing tastes. At Hazar Baba's stall and were fascinated by the wide range of teas flavoured with fruit, oils or spices. Here you could choose from both familiar tastes and highly surprising mixes. Ginger, rose, pomegranate, carcade (Hibiscus) are flavours that you may consider adding to your brew. For tea purists you may choose the house special mix (or maybe that may contain even more strange flavours), or a simple green tea. One thing is for sure; the Spice Bazaar is an exotic dream for foodies. Here you may purchase and bring home a taste of Turkey in a small plastic bag to be served on a plate or a mug. I even sometimes just open up the bag to inhale the aromas of the spice bazaar.